7,398 gross tons, length 411ft x beam 53.9ft, one funnel. two masts, single screw, speed 12 knots. Built 1920 by North of Ireland Shipbuilding Co., Londonderry for Nouvelle Compagnie Peninsulaire and chartered to Societe des Services Contractuels de Messageries Maritimes for cargo service between North Europe - New Caledonia - Australia. 1928 purchased by Messageries Maritimes and converted to cargo / passenger ship with accommodation for 40-1st and 50-2nd class passengers for the Pacific feeder services. 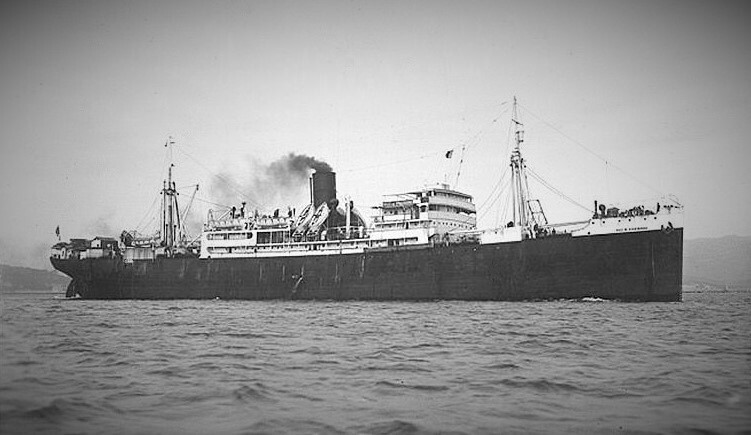 In Mar.1941 she was seized by the Royal Navy off the Cape of Good Hope and operated by the Ministry of War Transport, managed by Union Castle Mail SS Co.
1951 was reduced to cargo only and used on Indian Ocean services.